US, 1950, 135 minutes, Black and white. Bette Davis, Anne Baxter, George Sanders, Celeste Holm, Gary Merrill, Hugh Marlowe, Gregory Ratoff, Thelma Ritter, Marilyn Monroe, Barbara Bates. Directed by Joseph L. Mankienwicz. 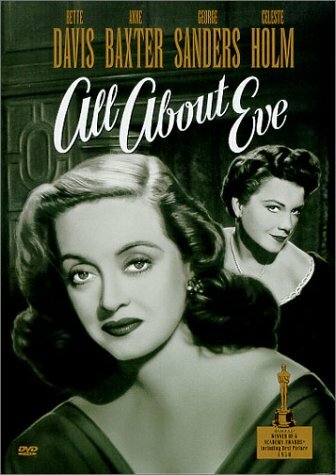 All About Eve has become a cinema classic since its release and awards in 1950. It holds a record of fourteen nominations for Oscars. Film, screenplay, director won them, as did George Sanders for Best Supporting Actor. But, of course, the performance is that of Bette Davis, ably supported by Anne Baxter who goes through the process of degenerating from seeming girlish innocence to ambitious guilt. All About Eve is a very clever film, highlighting the many facets of human nature satirically commenting on human behaviour, portraying the emotion-charged reaction in personality clashes, egocentricity and infatuations, with some stinging dialog coming from George Sanders. The world of the Hew York theatre, the papers and society is also exposed to Mankienwicz's caustic observation. Bette Davis is in her element as the abrasive ageing actress. Anne Baxter (who had won an Oscar for The Razor's Edge in 1946} gives a skilful performance. Marilyn Monroe can be see in a small part. Joseph Mankienwicz received an Oscar nomination in 1972 for Sleuth. Films in the meantime include Five Fingers, Julius Caesar, Barefoot Contessa, Guys and Dolls, Suddenly Last Summer, Cleopatra, The Honey Pot. 1. How ironic was the significance of the title by the end of the film? 2. Was the technique effective for this film - the comments by the leading characters and the flashback as the film froze at Eve's receiving her award? How suspicious of Eve did the reactions of the principal characters at the dinner make you? 3. The theatre world was satirised and criticised in the dialogue and situation of this film - how? Were the criticisms too severe, the implication being that this was a typical story? The role of critics like Addison De Witt? His satiric comments at the opening? - Eve herself - were you as charmed with her at the start as everyone else? Why was she so charming and thoughtful? What did the characters like about her? What did you like? Did her bowing with Margot's dress make you suspicious? Did you think Birdie over-suspicious? When did Eve begin to show her true colours? How did she change from then on? Trying to take Bill, Addison, Lloyd? Her pressures on Karen? How was Addison able to break her and hold her? What kind of woman was she by the end of the film; Were you surprised at the truth about her? How could she be so evil and cruel - hex acceptance speech and irony? - Margot - star, self-centred, tantrums? Did you like or dislike her - her jealousies and suspicions? Her relationship with Bill? Her interactions with Birdie? Why did she dislike Eve? How important was Karen's delaying her for her performance - what did this crisis reveal about her? How did it work out best for her? Were you pleased? What had she learned by the end of the film? Was she a better woman and, in giving up the role of Cor a more truthful one? What future did she have? - Karen - the outsider celebrity, what kind of woman and wife? Why did she support Eve? Why did she betray Margot - was it really a good idea? Could it have been a success? Why was she so moved by Margot's change of heart? Why did she grow to dislike Eve - the significance of the interchange in the Ladies' Room? The saving of her marriage? - Addison De Witt - how likeable or how loathsome a man? Why? Why was he so like Eve? Why did he want to destroy Margot? Why did he want to own Eve? Why did he despise her for lying to him as she did to everyone else? Was he cruel in subduing Eve by telling her the truth? What future did he and Eve have together? - Bill - what kind of director? Man? His love for Margot - why? Why was he so exasperated? Has he ever infatuated by Eve? Why was he so repelled at her trying to take him? His immediate reaction to Margot's hurt at Addison's column? Marriage? Directing Eve in the play? - Lloyd - playwright, man, husband? Why was he infatuated by Eve? Did he ever intend to leave Karen? - Birdie - why could she see through Eve? What support was she to Margot? - Miss Casswell - a newcomer to theatre, naive, ignored by the stars, guided by De Witt? How well did the stars play their roles and contribute their personal styles to the film, especially Bette Davis and George Sanders? 5. How clever was the dialogue? How telling? Why was the film considered one of the greats? 6. Did Eve deserve to get Phoebe? Did Eve see through Phoebe? Would she be outmanoeuvred by Phoebe? The irony of the ending with the many-mirrored reflections of Phoebe?